They will smile when they receive this charming gift that's packed with tender loving care. The sweetest selection of the season's best Oranges, a mini jar of 100% Orange Blossom Honey and a mini jar of our signature Orange Marmalade. An elegant box of treats at a truly affordable price. 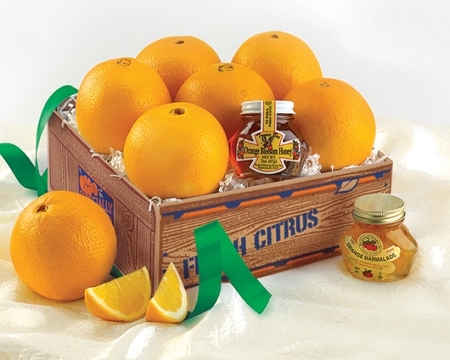 Note: Due to USDA restrictions, Florida Gift Fruit Shippers are not able to send deluxe fruit boxes and baskets to CA, TX, AZ, and LA. Please order all fruit items for these destinations.